One more unique drum from Provenance, the Pegu - with its expensively salvaged vintage Burmese teak - is truly a collector’s item, but equally a drum that should be heard. A truly awesome sounding drum. 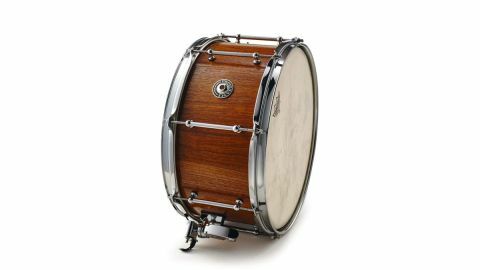 We’ve featured several of Tim Broughton’s Provenance snare drums before. Each is unique and boasts an interesting back story revealing the origin of the shell material. Essex-based Tim finds salvaged wood and metals from historic vehicles, ships, buildings, etc and fashions them into one–off snare drums. The evocative names of previous pieces tell the story, eg: 1982 Rolls Royce Silver Spirit, F4 Phantom Jet Fighter, 1866 West Pier. This time Tim obtained some Burmese teak recovered from the seabed wreck of the steamship (SS) Pegu. The Pegu left Rangoon in old Burma bound for Liverpool in 1917. Its cargo included Burmese teak earmarked for gun placements on the European front lines - this being deep into the Great War. Tragically, the Pegu was torpedoed by a German U-boat on 8 July off the south east coast of Ireland. The teak was finally salvaged in 2011, specifically sought for restorative work on the fire-damaged Cutty Sark in Greenwich. Tim managed to obtain enough of this teak to make two drums, the 14"x7" (pictured) and a 14"x6½", not yet finished. Construction involves 24 staves, 12mm thick, finished using several coats of what Tim describes as “a blend of high quality oils, resins and driers that give excellent protection against water, alcohol and food acid marks. Burmese teak has always been expensive and prized. Oils and rubbers in the wood protect it against dry rot, fungi and parasites, one reason it’s been used in ship building for centuries”. Great care is obviously taken finishing the drum with precise bearing edges and snare beds. Quality hardware includes eight solid brass, chrome-plated tube lugs, Dunnett R4 strainer and Puresound wires. The splendid Provenance badge is engraved internally with the legend ‘Remaking History’. Sound wise you’d be pushed to find a better drum. Fitted with a Remo Fibreskyn batter, the response is thick and dark, the Fibreskyn giving a parchment-like touch to the crisp stroke. The deep 7" shell ensures there is always gravity, while the thick walls and flanged hoops add a clear ring. In fact, it’s most pronounced and if we were DW’s John Good we’d tell you the note. A judicious bit of damping is enough to prevent this peal from becoming obtrusive, while retaining a rich and complex timbre. The stumbling block is, of course, the price. Tim explains that since our last featured snare (Ross Revenge, February 2017) all of his costs have increased dramatically. The Pegu teak, salvaged at vast expense, was also particularly pricey. The Pegu would make a lovely recording drum if you were worried about taking it out live, which is a shame, because it is a powerful, fiery drum that is great to play.